Home > Arts & Humanities > Art > Paul Delaroche Paintings? There is a major painting by French painter Paul Delaroche, who some thought have been destroyed during a World War Two German air raid on London in 1941, has been unrolled and found to be in good condition. 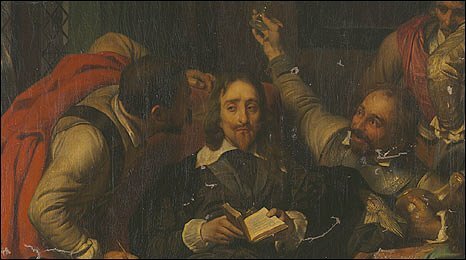 The painting is called "Charles I Insulted by Cromwell's Soldiers." It is a painting of the British king before his execution in 1649. I never saw it, is there a picture of Paul Delaroche's Painting? This painting has an interesting story. Restorers found some 200 tears on the canvas and fragments of plaster from the bomb blast, which hit the London home of its owners, the Ellesmere family. Despite the damage, the painting had lost none of its intensity after spending decades tucked away in a Scottish country house. The painting, which has yet to be fully restored, will be shown in London's National Gallery from 24 February. Similar Threads for: Paul Delaroche Paintings?